Here’s a selection of Events being held at this year’s 2017 Festival Week. More Events, and more detail on the Events listed below can be found in the soon to be published Festival 2017 handbook. There should be one popping through your door soon (Haddington Town addresses only), or one can be picked up from the Library at the John Gray Centre. Tickets and information on the events unless stated are available from the Festival Events Desk, which is located within the Corn Exchange during the Festival Café’s every weekday. 9am-1pm COURT STREET:- OUTDOOR FARMERS MARKET Purchase the delights of locally produced food at its best. Held on the Last Saturday of every month. 9am-5pm WHITTINGHAME DRIVE 3G PITCHES:- HADDINGTON ATHLETIC FESTIVAL OF FOOTBALL Start of a 2 day Festival of Football that will see 450 children invited to play friendly games from the ages of 5 to 13 including girls teams. Spectators welcome for free with refreshments, BBQ & variety of stalls will be available. 10am-2pm AMISFIELD WALLED GARDEN:- OPEN WEEK Open for visitors. Tours of the A listed garden available. Plants for Sale. Refreshments available. By car, enter from the East entrance to Amisfield Park, near Abbey Bridge from the road to Stevenson. On foot, via public footpath through golf course or along the north side of the Tyne. 9am-5pm WHITTINGHAME DRIVE 3G PITCHES:- HADDINGTON ATHLETIC FESTIVAL OF FOOTBALL Second day of the Festival of Football that will conclude the 2 day event with trophies on offer to all players. Spectators welcome for free with refreshments, BBQ & variety of stalls will be available. 1:45pm COURT STREET:- PARADE OF ORGANISATIONS All of the Haddington Organisations march through the town to the War Memorial. The Burgh Flag will be carried by a member of the Community Council. 2:15pm ST. MARY’S PARISH CHURCH:- SERVICE TO MARK THE OFFICIAL OPENING OF THE 2017 FESTIVAL. The Community Council wish to extend a cordial invitation to all organisations to participate in the parade and service. The parade will be under the direction of Sandy Mackinnon. 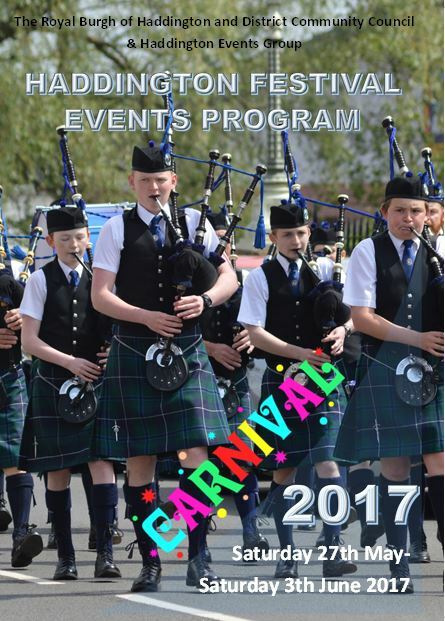 Haddington Pipe Band will lead the parade. 10am-2pm CORN EXCHANGE:- CRAFT FAIR, PLANT & TABLE TOP SALE Search around for some colourful plants for your garden and patio, some fine crafts by local East Lothian crafters. You may even find some hidden treasures at the table top stall. Hire of tables – £15.00 daily for a stall at the weekday cafes payable to Haddington Festival at the Festival Desk. 10am-2pm CORN EXCHANGE:- FESTIVAL CAFÉ Organised by HADDINGTON KINGSMEADOW SCHOOL Come along and support the local Infant School PTA and have a little lunch, coffee and browse the sale tables. 10am-2pm AMISFIELD WALLED GARDEN:- OPEN WEEK Open for visitors. Tours of the A listed garden available. Plants for Sale. Refreshments available. Directions as per 27th May. 6:30pm-8pm CORN EXCHANGE:- CHILDREN’S PET SHOW ANY KIND OF SMALL PET can enter. Admission:- Adult £1, Children 50p Pets 50p per pet. (refreshments will be on sale). Registration at Corn Exchange from 6.00 pm to 6.25 pm. Judging will commence at 6.30 pm prompt! 7:30pm-8:45pm ST MARY’S PARISH CHURCH:- Garleton Singers Concert The Garleton Singers choir perform in the fantastic St Mary’s Parish Church. Admission £10 (child £3) on the door or in advance from choir members, Betty’s of Haddington and Hilary’s Deli. Refreshments will be available. 10am-2pm CORN EXCHANGE:- FESTIVAL CAFÉ Organised by HADDINGTON INFANT SCHOOL PTA Come along and support the local Infant School PTA and have a little lunch, coffee and browse the sale tables. 10am-12noon TOWN HOUSE:- COFFEE MORNING Organised by Haddington & District Probus Club Coffee and Raffle. Tickets £2.00 from Festival Office and Probus members. 6pm JOHN GRAY CENTRE :- Blooming Haddington Garden Tour Blooming Haddington were formed in September 2013 and in 2016 were crowned best medium town in Great Britain. The walk will be a tour of what we show the judges when they come to visit Haddington. 10am-2pm CORN EXCHANGE:- FESTIVAL CAFÉ Organised by GIRL GUIDING HADDINGTON Come along and support the local Girl Guides and have a little lunch, coffee and browse the sale tables. All proceeds go to the local Guide funds. 7pm-9pm LADY KITTY’S GARDEN:- PÉTANQUE Haddington Twinning Association welcomes everyone to a ‘small corner of France’ for this evening. Try your hand at a game of Pétanque help if required with the rules and how to play. Boules will be provided or bring your own Admission is free. 8pm NUNGATE BRIDGE:- FLOAT YOUR BOAT FINISH LINE Thrilling finale of the Float Your Boat Race come find out if you are the winner. 10am-2pm CORN EXCHANGE:- CRAFT FAIR, PLANT & TABLE TOP SALE Search around for some colourful plants for your garden and patio, some fine crafts by local East Lothian crafters. Hire of tables – £15.00 daily for a stall at the weekday cafes payable to Haddington Festival at the Festival Desk. 10am-2pm CORN EXCHANGE:- FESTIVAL CAFÉ Organised by St MARY’S RC PRIMARY SCHOOL HADDINGTON Come along and support the local St Marys school and have a little lunch, coffee and browse the sale tables. All proceeds go to the local School funds. 1:45pm TRINITY CENTRE:- FILM CLUB “Jackie” with Natalie Portman The film tells the story of Jackie Kennedy in the aftermath of her husbands killing. Entrance is £2 and this includes refreshments. Everyone welcome. 7pm-9pm TOWN HOUSE:- LOOSE WUMMIN Join Bob Mitchell & his ‘Loose Wummin’ Liz McDougall (Haddington Pipe Band), Effie Renton (friends of the river Tyne), Liz Booth (East Coast FM) & Lorna Croally (Girl guiding Haddington) as they discuss the hot topics. Tickets £5 available from Betty’s of Haddington and Events Group Table at festival café. 10pm-2pm AMISFIELD WALLED GARDEN:- OPEN WEEK Open for visitors. Tours of the A listed garden available. Plants for Sale. Refreshments available. Directions as per 27th May. 10am-2pm CORN EXCHANGE:- FESTIVAL CAFÉ Organised by St MARY’S PLAYGROUP Come along and support the local Playgroup and have a little lunch, coffee and browse the sale tables. All proceeds go to the local Playgroup funds. 6pm-9pm NEILSON PARK:- Friday Night Shows Stewarts Funfair will be open in Neilson Park for a few hours. Extra consideration given to those who dress up in this years Carnival theme. Judging will be on the grass verge on the north side of Whittingehame Drive and starts at 12 noon sharp. Prizes for Best Dressed Individuals, Best Dressed Groups and Best Dressed method of transport in the categories of Pre-School, 5-10 years, 11-16 years, Adult. Parade to be led by the Pipe band starting at Whittingehame Drive, Hardgate, High Street, Court Street, up by the Railway, Hope Park, Lydgate, down past Tesco’s , Market Street, turn right into Hardgate, Sidegate up past Maitlandfield along Mill Wynd into Neilson park. CRAFT TENT and SALE STALLS:- Arts and craft items for sale to the public along with other stalls from Local groups providing you with some items to win, browse and buy. FACEPAINTING:- by Lori’s Creations. Children face painting £3, 2 for £5 Adults £4. The mighty Edinburgh Samba School :- bringing good vibes from Brazilian street parties to the Haddington Festival Fun Day. A lively, colourful drumming performance guaranteed to get everyone dancing to amazing beats. SPORTS HUB:-‘COME and TRY’ and DEMO SPORTS: – Open To all Sports clubs willing to participate will be putting together a programme from 1pm to about 4pm. BRIDGE CENTRE MUSIC PROJECT STAGE:- An array of local talent from the Bridge Centre Music Project showing off their musical talents through the day. Haddington Community Council and Haddington Events Group would like to thank all of the Local Groups and Businesses who have taken part in this years festivities. All the advertising in this programme pays for the printing and distribution to every household in Haddington for free so please show your support and shop locally. And of course you the Haddington Public without everyone the Festival would not be as successful as it is. The following organisations have provided us with support and may not have been mentioned in this programme. Brunton Theatre Musselburgh, East Lothian Council, Haddington Garden Trust, Haddington Library, Holy Trinity Church, Knox Academy School, Haddington Fireworks, Scottish Fire and Rescue Service and Police Scotland.